Stewart was officially diagnosed with a torn Achilles and will likely miss the entire 2019 season. As expected, Stewart suffered a torn right Achilles' tendon Sunday against Dynamo Kursk in the EuroLeague Final Four, and the WNBA will be without its reigning MVP for the upcoming season. It's a huge loss for the Storm, who will struggle to defend their WNBA title without their best player. Seattle will now be looking to the likes of Natasha Howard, Alysha Clark and Crystal Langhorne to up their frontcourt production to make up for Stewart's now-absent 21.8 points and 8.4 rebounds per game. Stewart sustained the injury in question late in the second quarter, when she landed on the foot of fellow countrywoman Brittney Griner while attempting a jump shot. The 24-year-old required assistance off the court and was unable to put any weight on her leg, hinting that a serious injury might be in play. A diagnosis likely won't be confirmed until Stewart undergoes additional tests, but if she did in fact tear her Achilles', she would almost certainly require surgery that would sideline her anywhere from six months to a year. Her potential season-long absence would be a devastating blow to the Storm -- who begin their title defense in late May -- and the WNBA, as Stewart is one of the league's premier players. Stewart collected 25 points (7-13 FG, 1-3 3Pt, 10-14 FT), seven rebounds, three assist and two steals during the Storm's 75-73 Finals victory over the Mystics on Sunday. Despite five turnovers, Stewart had a terrific outing in the Finals win Sunday, reaching the 25-point mark for the fourth time this postseason while grabbing seven rebounds. Stewart and the Storm will look to close things out this season with a win at Washington on Wednesday. Stewart finished with 22 points (7-14 FG, 1-3 3Pt, 7-8 FT), five assists, three rebounds and one steal in the 89-76 Finals playoff win against Washington on Friday. 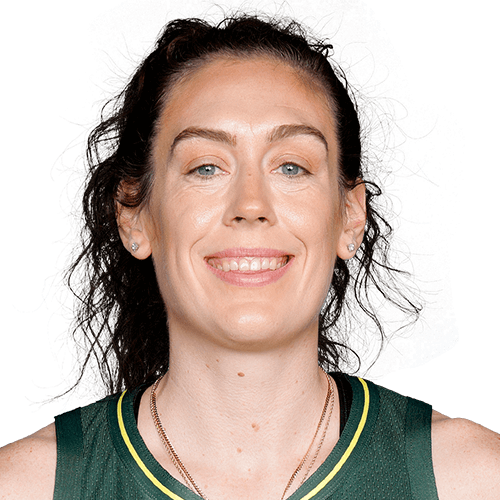 In 32 minutes of action, the 2018 WNBA MVP had a superb outing as she dropped 22 points on 50.0 percent shooting from the floor while adding a seven-of-eight mark at the free-throw line. In six postseason games so far, Stewart is averaging 23.7 points and 6.7 rebounds per game. Stewart added 28 points (11-21 FG, 1-3 3Pt, 5-6 FT), seven rebounds and two assists in Tuesday's 94-84 home playoff win against Phoenix. Stewart played all 40 minutes of action in the win Tuesday and dropped a game-high 28 points on 52.4 percent shooting from the field. This postseason, the 2018 WNBA MVP is so far averaging 24.0 points and 7.4 rebounds across five playoff contests. Stewart posted 27 points (10-22 FG, 1-4 3Pt, 6-8 FT), four rebounds, two blocks and one steal in the 91-87 playoff win over the Mercury on Tuesday. Despite struggling from three-point range, Steward had yet another superb scoring game, this time managing 27 points on 45.5 percent shooing. In two games this postseason currently, the 2018 WNBA MVP is averaging 27.5 points and 5.5 rebounds per outing. Stewart dropped 28 points (9-18 FG, 6-9 3Pt, 4-4 FT), seven rebounds, three assists, two steals and one block during the 91-87 playoff win over the Mercury on Sunday. Recently named the MVP of 2018 WNBA campaign, Stewart picked up right where she left off in the regular season and reached the 28-point mark Sunday on 50.0 percent shooting while knocking down six three-point attempts during the playoff win. In the regular season, the 24-year-old averaged 21.8 points and 8.4 rebounds over 34 appearances. Stewart recorded 22 points (6-8 FG, 5-6 3Pt, 5-8 FT), 15 rebounds, two assists, two blocks and one steal across 35 minutes during Friday's 85-77 win over the Liberty. Stewart has played well as of late, posting three double-doubles with at least 17 points over the past four contests. She's been one of the WNBA's most dominant two-way forces on the season, ranking second in points per game (22.0), third in rebounds (8.6), seventh in blocks (1.5) and eighth in steals (1.4). She's also top-10 in both field-goal (52.6) and three-point (40.3) percentage. Stewart added 17 points (7-15 FG, 1-2 3Pt, 2-4 FT), 12 rebounds, four assists, one steal and one block during Tuesday's 94-79 road win over the Fever. This was Stewart's seventh double-double of the 2018 season, as she dropped 17 points on 46.7 percent shooting from the floor while grabbing a team-high 12 rebounds in the win Tuesday. Posting 22.6 points over 30 outings this year, the third-year forward is currently 0.2 points behind Liz Cambage's league-leading scoring average this year. Stewart had 32 points (12-25 FG, 3-7 3Pt, 5-5 FT), nine rebounds, five assists and one block during Monday's 96-80 win at New York. Stewart fired away during the win Monday, attempting 25 field goals while knocking down 12 of them en-route to a game-high 32 points. The 24-year-old is currently tied for first place among all WNBA scorers with 22.8 points per game across 29 appearances this year. – The rookie’s 12 FGM were a career-high, as was her 75.0 field goal percentage (12-of-16). – This is the first time a Storm player has scored in double-figures in two or more quarters since Shekinna Stricklen completed the feat on 8/4/14 at Minnesota. Stewart had 11 points in the first quarter and 13 in the fourth quarter.